The modular and flexible design of the WorkFit-LX fits most any space while providing personalized ergonomic positioning. This stand-up desk system enables complete control of focal distance and the position of the keyboard relative to the monitor screen. The LX offers unparalleled range of motion, easily accommodating a user’s sitting or standing posture. 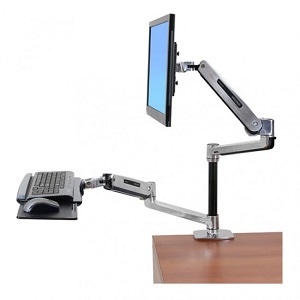 Features include 20 inches (51 cm) of height adjustment and 62 inches (157 cm) of side-to-side movement. - Compact footprint—fits in tight spaces including corner desks!